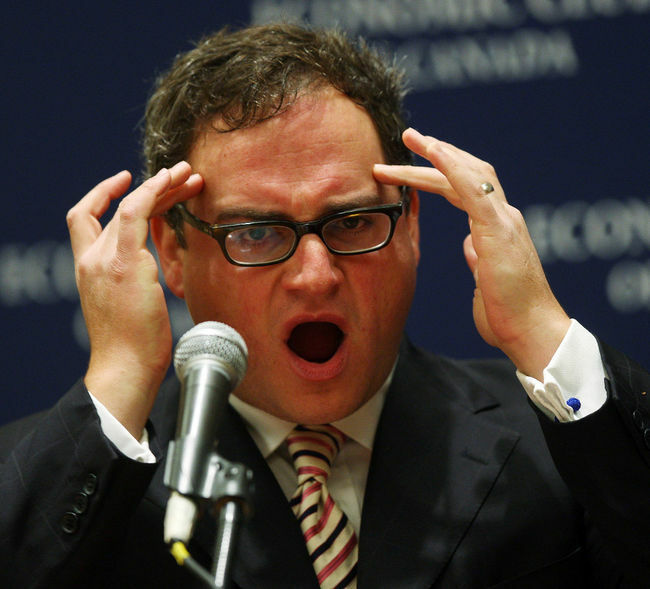 Ezra Levant in a typical pose. bsent context, the Canadian political right has cultivated a new stereotype for itself in the last two decades. Led astray in the wake of the Great Conservative Cataclysm (the deed of former Conservative Prime Minister, Brian Mulroney via Schreibergate), provocateur pundits like Ezra Levant have a new favourite tactic: to use character assassination and innuendo to shape political fortunes when the strength of goals and ideas can’t be found. And in today’s Sun News’ “Straight Talk” column, a renewed drumbeat of criticism and dogma handed those of us who have a vein somewhere on our foreheads that thirsted to be-a-throbbin’. Brought to us by way of Twitter: @SunNewsNetwork writes “Trudeau opposes revoking the citizenship of Canadians suspected of being involved in terrorism,” inviting readers to Ezra’s article and another poll that the neocons can use to erode liberties a little further, no doubt. Funny how the right never seems particularly interested in getting at the truths comprising an issue and instead revert to wordplay masquerading as an unbiased poll (we’re supposed to ignore the leading nature of the question — after all, you don’t want to support terrorism do you?) which then somehow gets quoted in Question Period, in campaign literature or one of those helpful automated phone calls made during dinner. The article itself turns out to be a tissue of quotes taken completely out of context; and you know there’s some constituency out there inhaling this stuff like a crack addict. But how bad can it possibly be? Surely there aren’t that many of ‘em out there… Oh yah, this is the group running the government right now. Yes, there actually are enough people swallowing this stuff hook, line and sinker or people like Ezra wouldn’t have a job, and Harper wouldn’t be Prime Minister. But Trudeau didn’t say Communist China was his favourite foreign country — it was just China, and he spent a bit of time there earlier in his life. Yes, you can favour decriminalization of drugs without advocating everyone should get high more often! And taking quotes completely out of context and asking “Pardon?” as if it was Trudeau that didn’t make any sense instead of Ezra himself: this is just not supporting a political view centered on facts, reality or truth. I don’t know how I will get through the next year if I have to watch the country come unravelled because Conservative politicians using vague ad hominem references, McCarthyist innuendo about views pursuing innocent political debate, or — I swear to God — one more tissue of lies published by Ezra Levant simply because he’s anxious to engage in another inflammatory, disingenuous diatribe on Liberal campaign issues (which aren’t published just yet). Ezra, if the truth really will hurt the Liberals so much when they go public with their campaign, why are you slithering about the nether regions of what passes for Canada’s political theatre conjuring up demons? Why not cling to whatever integrity as a journalist you have left and simply await this field day of yours, smiling patiently? Reducing the political discourse to the degree you do really is bad for the country! anadian Prime Minister Stephen Harper got a few more shots in on Liberal Party Leader and upstart threat to the nation’s highest political office Justin Trudeau late last week by complaining that Trudeau’s position on drug de-criminalization amounted to trying to force the nation’s children onto drugs. When will the Conservatives finally realize that such nonsense is out-of-touch with average Canadians (if not average Canadian voters)? I suppose the message might have to await the next federal election – but it’s really difficult to listen to this guy without wondering if his Machiavellian treatments of Canada’s democratic process aren’t ever going to stimulate the electorate out of its apathy just once in my lifetime to bring a sense of reason back into our political process! Source: CBC News / CBC Power & Politics with Evan Solomon, August 29, 2013; Copyright ©MMXIII (2013) Canadian Broadcasting Corporation, all rights reserved. YouTube.com edition reproduced here under “fair use” provisions of Copyright. 1. Cabinet shuffles don’t change government fortunes. When a regime is drifting (as the Harper government is) or looking tired and old and near the end of their usefulness (ditto), prime ministers will shuffle their cabinets. They do it all the time, in the faint hope that it will make them more popular, or at least less unpopular. It’s a strategy that doesn’t work. Can you picture the aforementioned Joe Frontporch at the kitchen table, hollering: “Jane, we’re going to vote Conservative again, because there’s a new minister of Veteran’s Affairs! Hallelujah!” Sounds crazy, no? That’s because it is. Well, not to defend our misguided PM — but, frankly, I have trouble thinking of him as that stupid. He’s trying to do what CEOs and managers in business find themselves doing when fortunes begin to sag for no apparent reason. Re-ignite past success by (perhaps) having capable people take on new challenges in a different role. Does it work? It can, though Kinsella might find himself mistakenly thinking he accurately diagnosed the reason because the outcome happens to be what he expected. 2. Stephen Harper is the Control-Freak-in-Chief. Never in our history has there been a prime minister so preoccupied with micromanagement and centralization. Never has there been so little delegation as there has been under Harper, who makes Orwell’s Big Brother look like a dope-smoking slacker. For Harper and his minions in the PMO, ministers are to be controlled, not given control. With the Control-Freak-in-Chief, who is in cabinet – and who isn’t really doesn’t matter. But Canadians have been content to let this slide too along with everything else it seems. The mantra “Who else can you vote for?” has become the Conservative’s sure ticket to power and since it’s that kind of slogan that can inspire the electorate, why not the political high-stakes play of a cabinet shuffle too? Optics über alles! 3. L’etat, c’est lui. Harper isn’t just the head of the federal government, he IS the federal government. For the Conservatives, that’s been the good news: A smart, strategic leader ran the show, and helped them win power in 2006. But, paradoxically, it’s the bad news, too. There are no viable successors waiting in the wings. And there is no minister strong enough to give cover to Harper when he stumbles, as he has indisputably in l’affaire Duffy. If you can name a dozen of his ministers and their portfolios off the top of your head, you deserve the Order of Canada. He’s right about it being bad news — even withstanding the horrifying picture of Duffy stumbling on the minds of voters. But amid this latest shakeup, even Harper has had trouble maintaining his balance in the corridors of power. And the aftershocks are far from done with the RCMP investigation of the absentee PEI Senator just getting into full swing. And a cabinet shuffle, no matter how cynical one gets about the electorate, will not erase the memory of Duffy’s fall from grace or corpulent expense spending from mind. One also can remember recent Liberal success with “Team Chrétien”…which might well be something the country can get behind as a distinctive style difference with Harper, should Trudeau take up that approach during a forthcoming campaign. 4. A shuffle won’t change the fundamental problem. And Harper’s problem is well known and not even disputed by smart Conservatives: The governing party has lost its way. There’s no raison d’etre anymore. There’s no mission statement. Nobody in the Conservative caucus remembers why he or she was sent to Ottawa in the first place. A cabinet shuffle won’t change that problem, it’ll draw it into sharper focus. None of the many youngsters with “P.C.” appended to their surnames will feel powerful enough, or independent enough, to challenge the boss. So get ready for same old, same old. 5. Nobody will notice. Forests will be felled to print opinion columns about the cosmic significance of the fashion sense of the newly minted minister of Public Safety. But Joe and Jane Frontporch won’t actually read any of those columns (which is one of the reasons broadsheet newspapers are in a spot of trouble, but that’s a lament for another day). Points #4 and #5 seem to contradict each other somewhat. But on the whole, it all relates back to point #1: cabinet shuffles don’t change election results — but that’s not what this was ever about. It’s more internal management of PR for the Conservatives than anything. And, yes, that’s all that this government has ever really been about. Meaningless Law and Order measures, changing armed forces rankings, and lukewarm gun control rollbacks are the hallmark of Herper’s time in office. In the end, that’s how history will record this period in Canadian history. No cabinet shuffle will change that one iota.